Not the scales of a lizard, but of the Lizard. The Scale of Points for Lizard Canaries (to give it its official title) has been around for more years than any living person has been breeding them. It is so well established that we never question its origins and assume things were always so, but surprisingly we don’t know who wrote it, when, or why it takes the form it does. You may think that the answer is obvious: surely the LCA ‘wrote’ it, and it was later adopted by COM as a worldwide standard? For all practical purposes that is close enough, but it doesn’t mean we know who, when or why. It is those questions that I am going to investigate here. You will see that the scale of points gives equal weight to the cap and spangles, with ground colour not far behind. Rowings are not mentioned. The importance of the cap reflects the fact that only clear caps were permitted at shows. The number of birds on show must have been quite low. Spangles are given precedence with 30 points plus another 5 on the neck, the latter being something we rarely hear of now. There are adjustments to the points for other features, but still nothing for rowings. To his credit, Blakston advocated classes for broken caps (in which he included non caps) on the grounds that “absolute perfection in the cap of a Lizard is so extremely rare that to insist on its invariable presence without the slightest departure therefrom is, practically, to demand what does not exist”. This scale is notable for two reasons: firstly it acknowledges rowings; secondly, we know who wrote it. C.A. House in his Canaries (1928) tells us that “some years ago, when the Lancashire and Lizard Canary Fanciers’ Association drew up the standard, they paid me the compliment of asking me to submit a draft, which was accepted”. These were the last years of the L&LCFA. It became moribund during the Second World War and never resumed its activities. I am not aware of any announcement of its demise, but people must have been aware of the vacuum, because the Lizard Canary Association was formed on 15 May 1945, only seven days after the official end of the war in Europe. William Scott joined in May of that year. With hindsight, the formation of the LCA was either very presumptuous or incredibly enterprising. In the minutes of the inaugural meeting, the LCA confirmed that it was “agreed that the present standard of the birds should be left exactly as it is. There was no question of alteration”. This can only have referred to the L&LCFA standard, which we know was still in force prior to the outbreak of war. 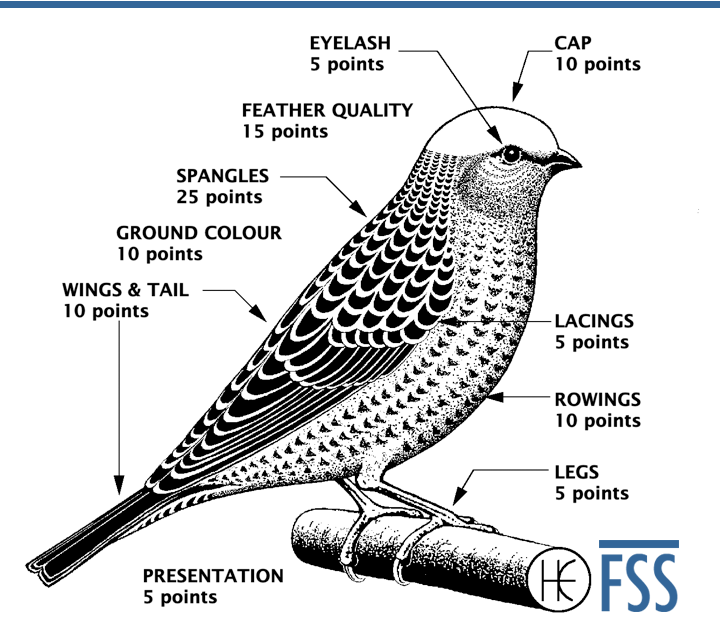 Yet the LCA scale of points differs in several respects, as you can see at the head of this article: the rowings were elevated to 10 points; ground colour reduced by 5 points; 15 points introduced for feather quality; and the points for size omitted altogether. It was probably the biggest revision to the standard in the history of the breed. Even more surprisingly, there is no record of who wrote the new standard; when the changes were introduced; or why these changes were deemed necessary. The oldest copy of the LCA Scale of Points for Lizard Canaries that I am aware of is dated March 1955. It is exactly the same as the one in force today. This version was printed almost ten years after the LCA had been formed. It begs the question: contrary to intentions of the inaugural meeting, did the LCA decide that the L&LCFA standard was no longer fit for purpose and that it needed a complete overhaul? Very few records of the LCA’s first decade have survived. LCA did not publish a handbook until March 1954, but a clue is given in the third edition of the handbook, March 1955. Terry Dodwell, the editor, wrote an article entitled Changing Values which described the evolving show standards (there is nothing new under the sun – this article is merely a variation on the same theme). The article includes the “Present Standard of the Lizard Canary Association (1945)” – the one that is still in force today. This might suggest that the scale of points was also formulated in 1945, but the date is crossed out. As it happens there is an annotation in John Scott’s hand on the same page, so we can be confident that the date was struck out by John himself. This can only mean that he knew the year was wrong. Unfortunately he didn’t insert a correction. If we can’t establish ‘when’, perhaps we can identify ‘who’? There were only four people present at the inaugural meeting of the LCA: Messrs Lewis, Oakley, Perry and Yates. None, to the best of my knowledge. were long-established Lizard canary breeders. Of the officers named in the 1954 handbook, A.W. Smith, W.P. Barnes, A.E. Lennie and A. Barras had very long associations with the Lizard canary, while John Scott and Fred Snelling were good writers but relative newcomers. There may have been several contributors, but there is no record of who they were. ‘it would be considered of very poor type, “snakey” about the head and neck and decidedly “rollerish” in general confirmation. Furthermore, the most strking feature (or rather the lack of it) is the almost complete absence of breast and flank markings’. From this we can infer that a new standard was necessary because the L&LCFA standard no longer represented what breeders considered to be the ideal Lizard canary. In 1945 it was the survival of the breed that was paramount, but as the numbers of birds and breeders grew, people could concentrate on improving the breed. The old standard did not suit that purpose. The authors (whoever they were) of the LCA’s Scale of Points for Lizard Canaries did a good job. It is universally adopted and has stood the test of time. It remains unaltered since its conception and, in my opinion, it is by far the best iteration of the show standard for the Lizard canary ever written. Well spotted Ian. There is an obvious typo (wings & tail should be 10 points) but I’m sure you spatted that too. Ever thought of being a judge? Regarding Mr W. P. Barnes, mentioned in the 1954 Year Book, I have a Cage Birds article from February 1955 which mentions the L.C.A. AGM held at the 1954 National at Olympia, agreeing to send Mr W. P. Barnes a ‘small memento’ to acknowledge his long and distinguished connection with the Lizard Fancy in having kept Lizard canaries for 70 years. Mr Barnes was at that time 87 years of age taking his association with the breed back to 1884. Indeed; W.P. Barnes was undoubtedly a living link between the Victorian era and the early years of the LCA. His memories of the Lizard fancy will be published in a future article, thanks to the Scott Archive. Good morning Huw. I read this with great interest. Nice to see such a well presented blog.